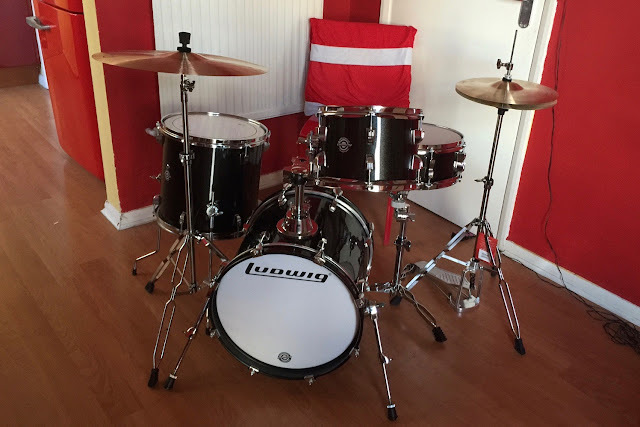 Given up blogging to learn to play drums! 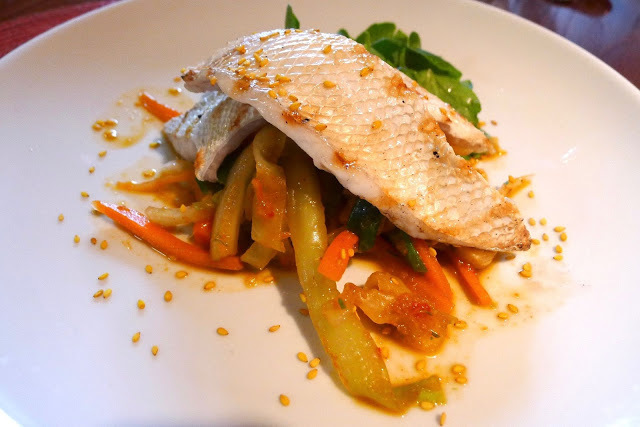 You can’t beat a good meal and, since starting this blog, I've enjoyed my hobby of writing about many of them that I've enjoyed. The thing is, my wife bought me a drum kit for Christmas and learning the jazz ride cymbal pattern and how to paradiddle-diddle has taken up much of my time over the last few days. With a new hobby to keep me out of trouble, I’ve decided to take a break from writing "detailed" blog posts. I’ll still be eating food so will continue to tweet and may put a few pics on here from time to time but don’t expect all the usual twaddle. 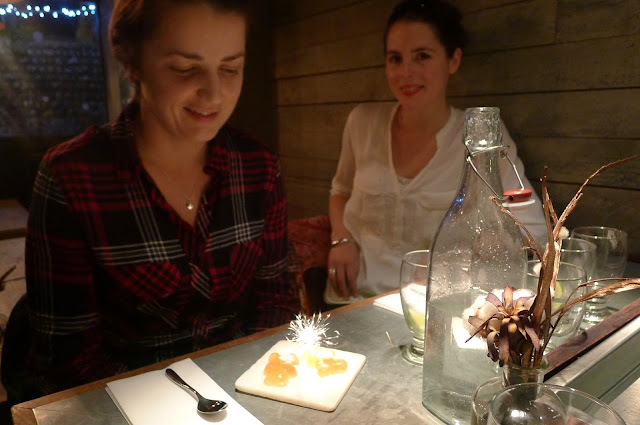 Visiting Brighton for my stepdaughter’s birthday, we were lucky enough to bag a cancellation at one of our favourite places to eat! After having selected 24 of the best dishes I’ve eaten throughout the year, I realised that, had I thought ahead, I could’ve revealed them advent styleé – sadly, I’m not that organised. So instead, presented chronologically, here they are in one whack. 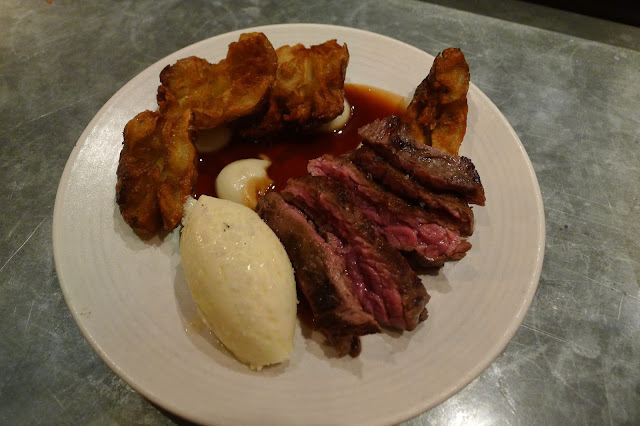 There are dishes from One, Two and Three Michelin starred restaurants as well as my favourite bistros, burger joints and pubs. Dishes are here for different reasons – some for their bold flavours; others for their lightness of touch; some for innovation; others for their brilliant simplicity where the quality of the produce has shone through… but each of these dishes have one thing in common, for one reason or another, these are the foods that have lingered longest in my memory. 1. 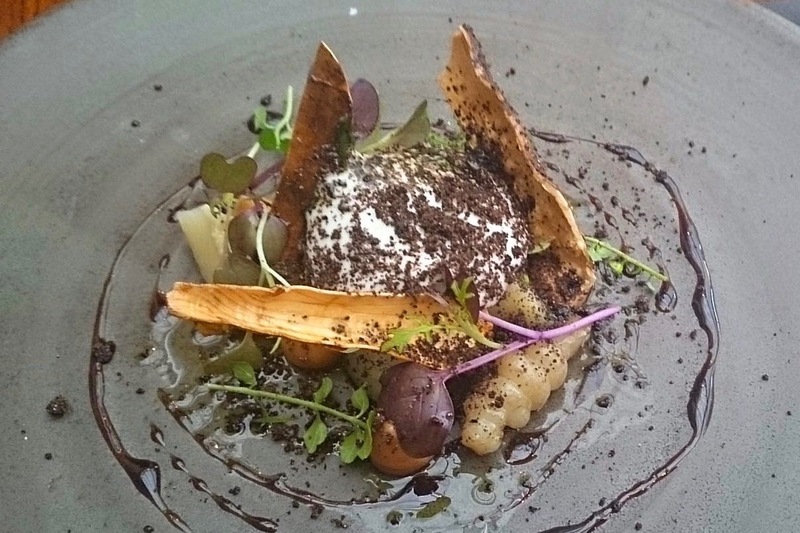 Artichokes with Goat’s Cheese, Tarragon, Stout Vinegar & Malt – L’Enclume (January) – on a tighter budget this year, I have only made one trip up to Cartmel. 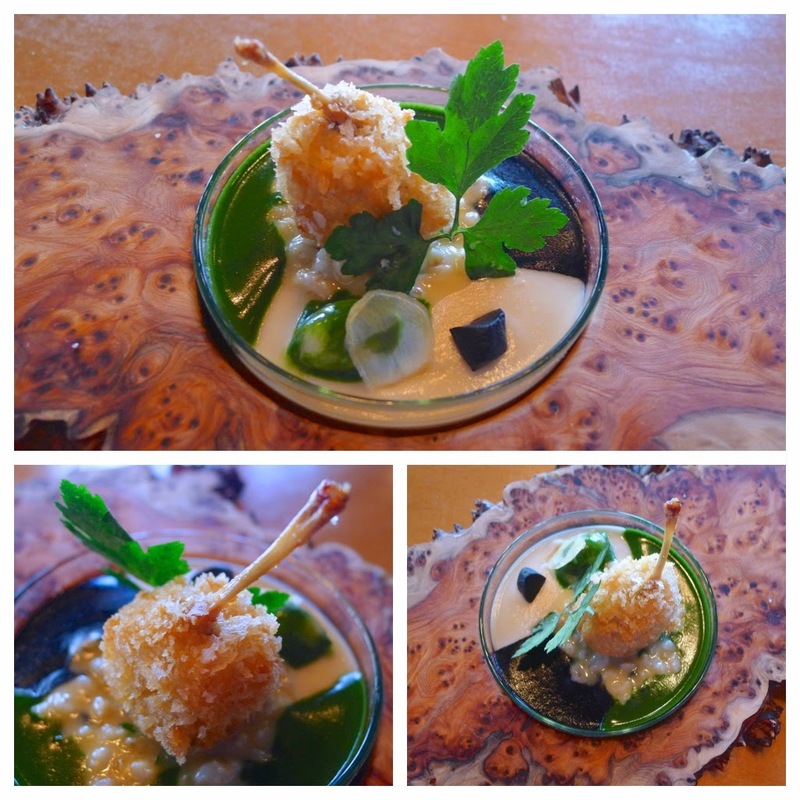 Since then, Head Chef Mark Birchall has left and is set to open Moor Hall in the summer of 2016. There may be changes at L’Enclume but I hope the artichoke dish, which also made it onto my ‘best of 2014’, stays in one form or another. 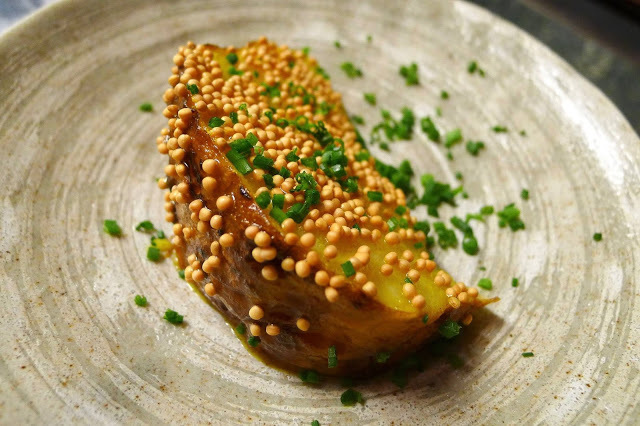 As with many of Simon Rogan’s dishes, it’s a technically skilled, creative dish that may look delicate but boasts real clarity to the flavours. 2. 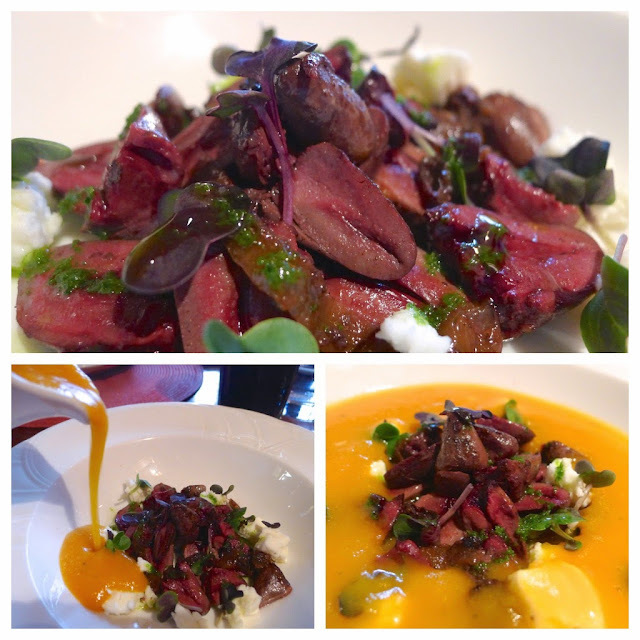 Wild Local Game Hearts with Butternut Velouté – Parkers Arms, Lancashire (February) – thanks to Chef Stosie Madi’s cooking, passion and seasonal sourcing, a trip to Parkers Arms is always a treat. A warming welcome from Kathy, AJ and the fire glowing in the hearth also makes the trip over the hills to this delightful rural pub a truly memorable experience. 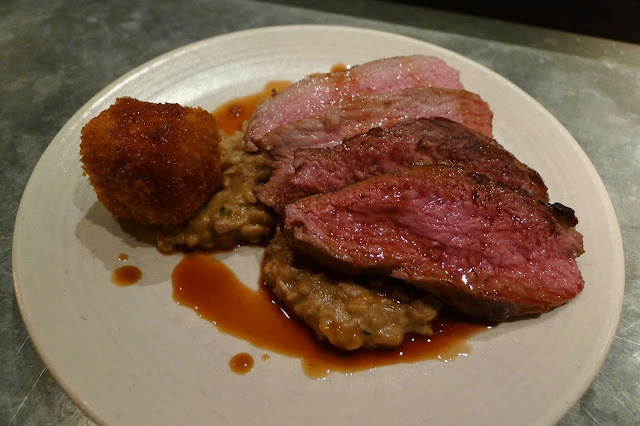 Of all the dishes I’ve eaten this year, this plate of duck, partridge and teal hearts, highlights the joys of hearteningly rustic, refreshingly unfussy food from a supremely talented chef who just… “gets it”. 3. Deep Fried Frogs Legs with Parsley & Garlic – Manchester House, Manchester (February) – Manchester House is one of the many restaurants that I’ve been meaning to return to for some time to experience their tasting menu. 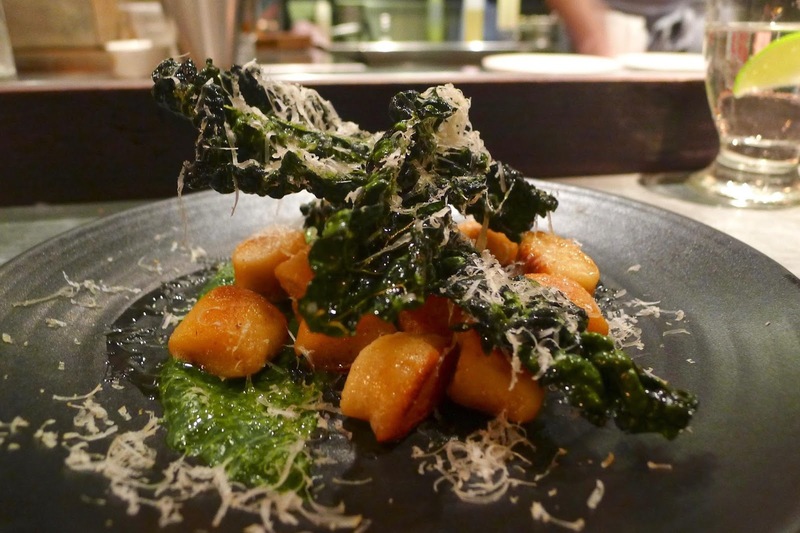 Since opening Aiden Byrne’s food seems to be going from strength to strength. 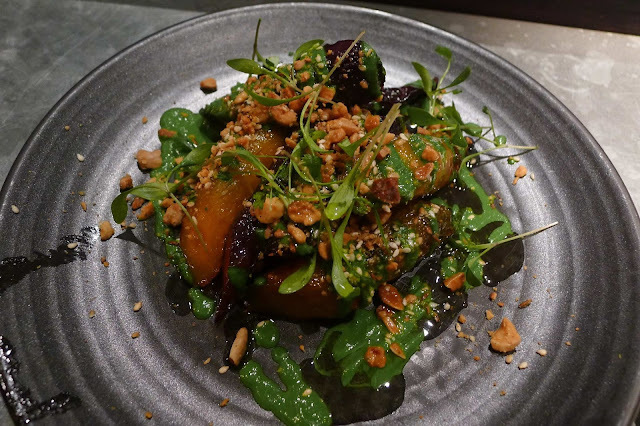 My lunch there in February was definitely one of my year’s culinary highlights – the fermented black garlic works so well in such a confident, balanced and innovative dish. 4. 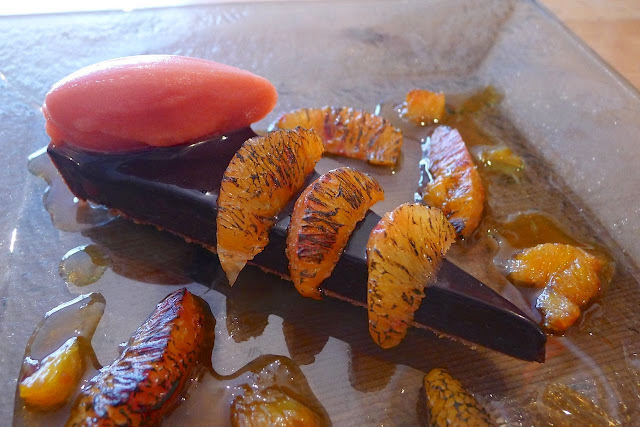 Dark Chocolate Tart with Blood Orange Sorbet – Sticky Walnut, Hoole (March) – I don’t have much of a sweet tooth but one look at this shimmering, sexily smooth dark chocolate tart and you’ll see why this is the only dessert to feature on this list. Sticky’s tarts are always a treat but they excelled themselves with this one. 5. 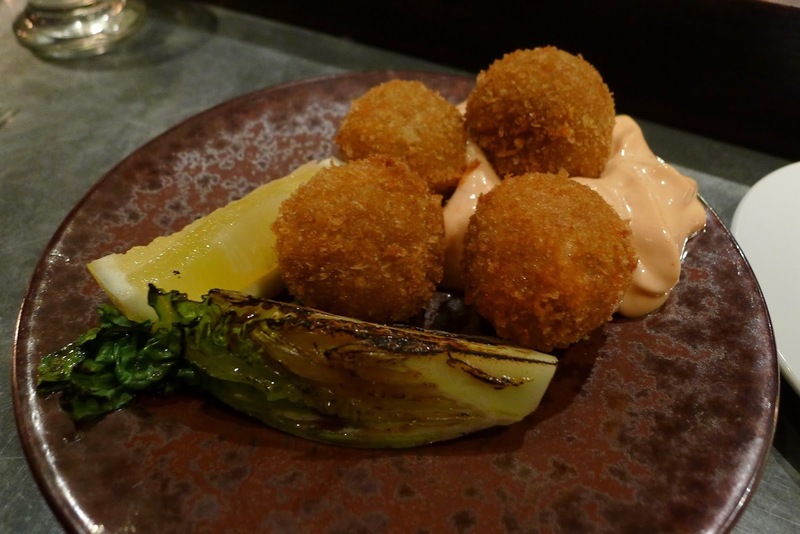 Jerusalem Artichokes & Sussex Yeoman Cheese Sauce – Silo, Brighton (April) – with their caramelised skins, fluffy centres and creamy Yeoman Cheese, I loved these artichokes perhaps a little too much. 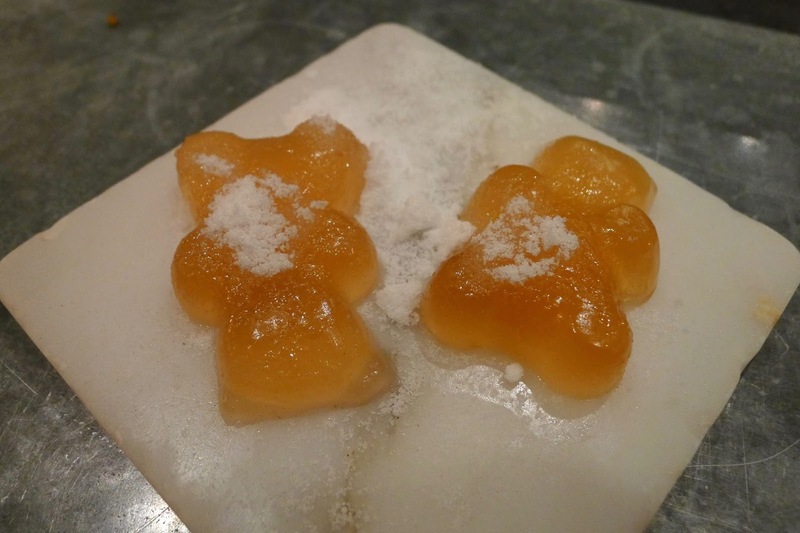 After polishing off two portions of them, I could barely walk. 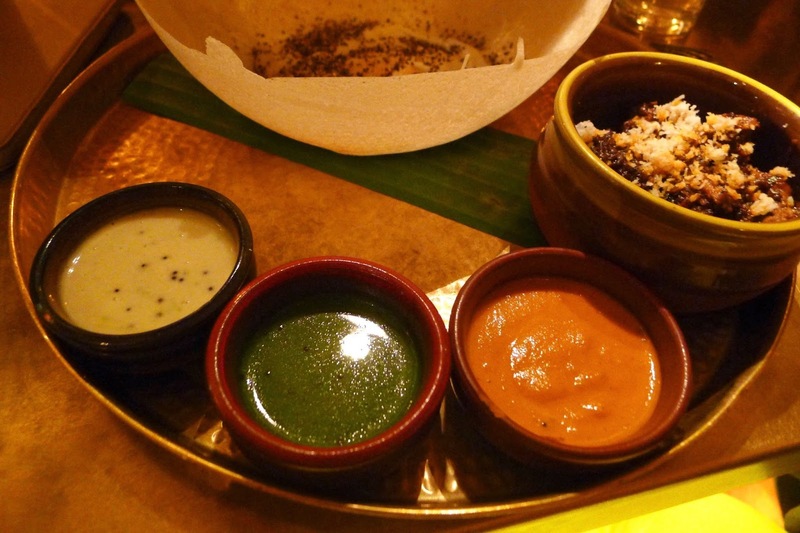 With the restaurant’s eco friendly ethos, I felt good that I had helped the world too! 6. 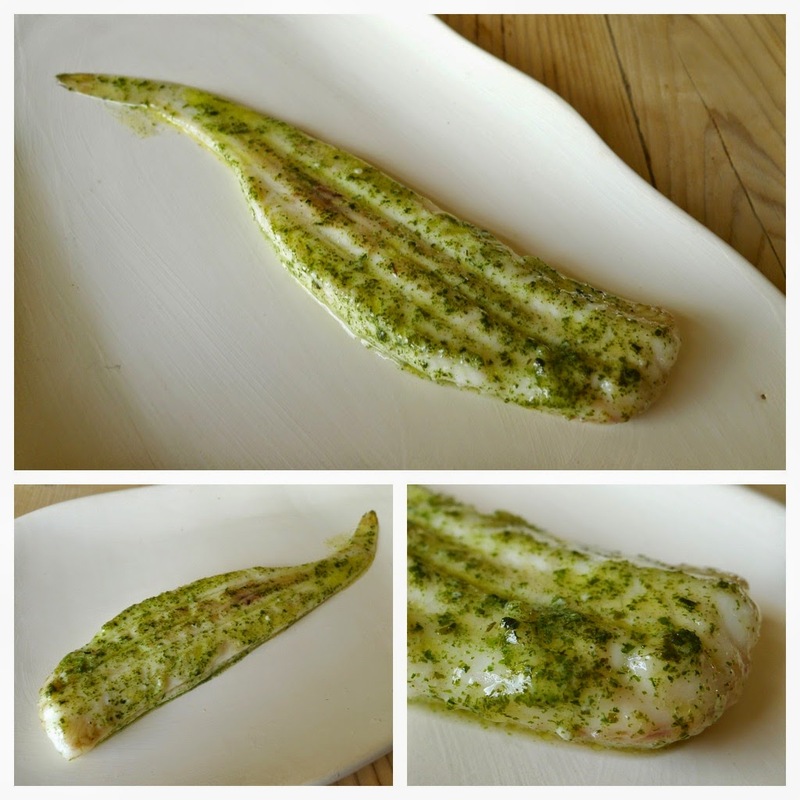 Slip Sole grilled with Seaweed Butter – The Sportsman, Seasalter (April) – The Sportsman is one of those places that I had wanted to visit for some years. I finally got the chance and it lived up to all expectations. 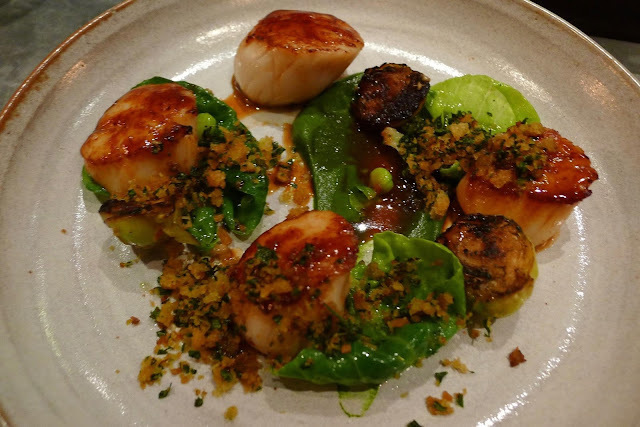 Allowing the natural flavours to shine, it’s a rare treat to be served such an appealingly simple yet supremely satisfying dish. 7. 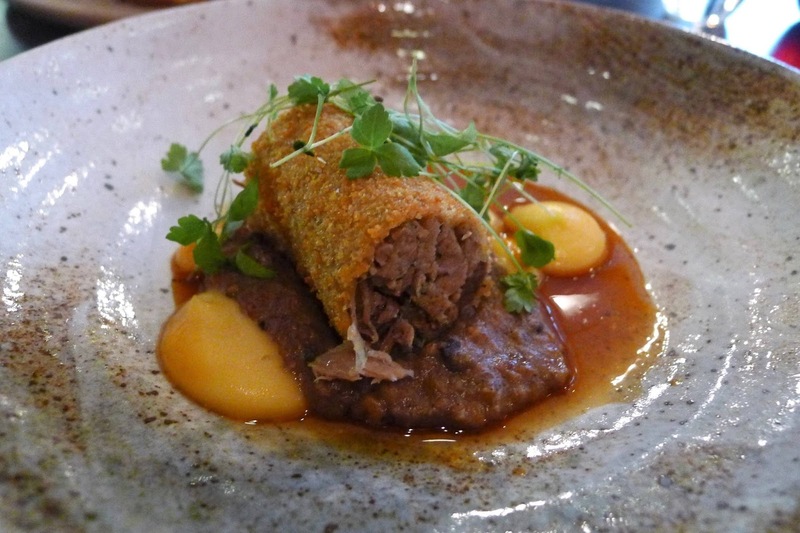 Veal Sweetbreads & Kidneys with Mustard Sauce – The Walnut Tree, Abergavenny (June) – The Walnut Tree is one another place I’d long been wanting to visit. It was a real privilege to eat Shaun Hill’s food. 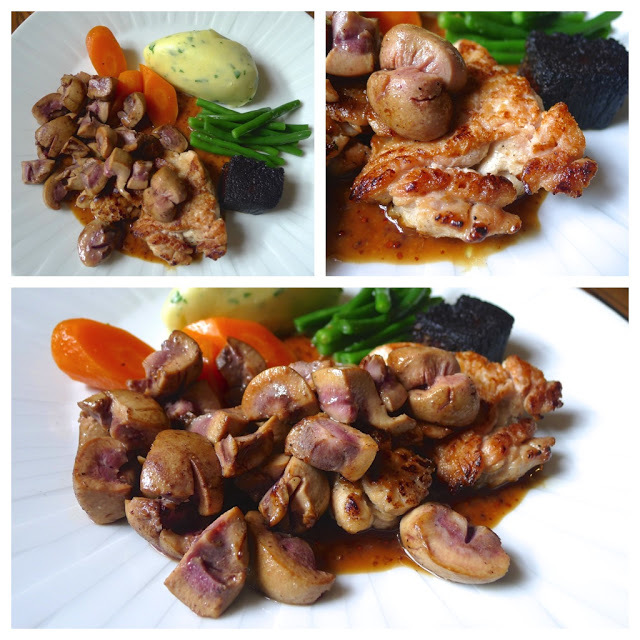 The veal sweetbreads and their kidneys were joyously cooked and the mustard sauce made with veal stock was a thing of beauty. 8. 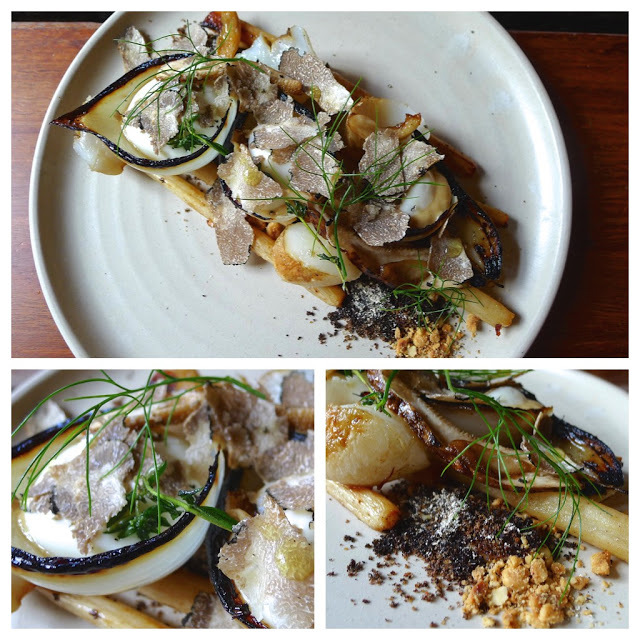 Salsify, Artichoke, Truffle, Onion, Mushroom & Hazelnut – Timberyard, Edinburgh (July) – we visited some great restaurants in Edinburgh for my birthday but when I think back to what we ate this salsify dish is the first that pops into my head. It had the most wonderful earthy flavours and textures that made it exciting to eat. 9. 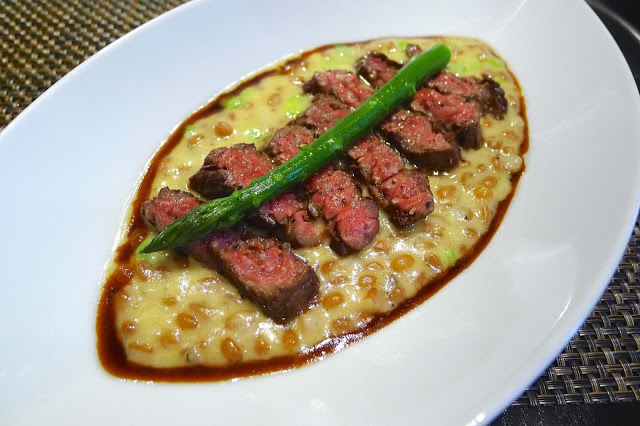 Spelt Risotto with Seared Hampe of Scotch beef & Wye Valley Asparagus – Castle Terrace, Edinburgh (July) – we had such a great meal at Castle Terrace, so it came as a bit of a shock when Michelin took away their star for the 2016 guide. 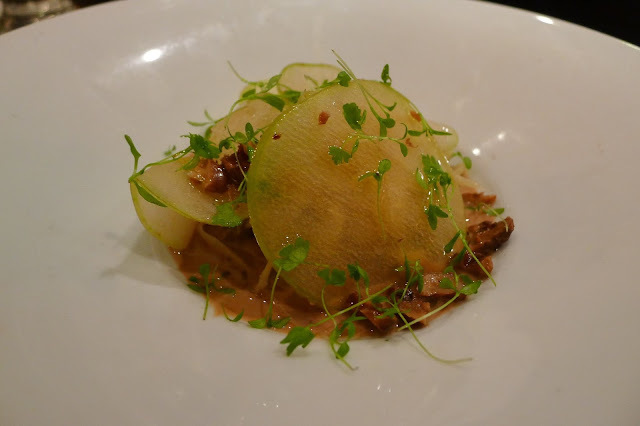 In my book, it was Michelin starred standard throughout the meal; this spelt risotto was just one highlight. 10.Cheeseburger Spring Rolls – Solita, Manchester (August) – amongst some of the elegant, luxurious dishes listed here, the Cheeseburger Spring Rolls at Solita may seem a little out of place. Anyone who has eaten them will know why they’ve been included. 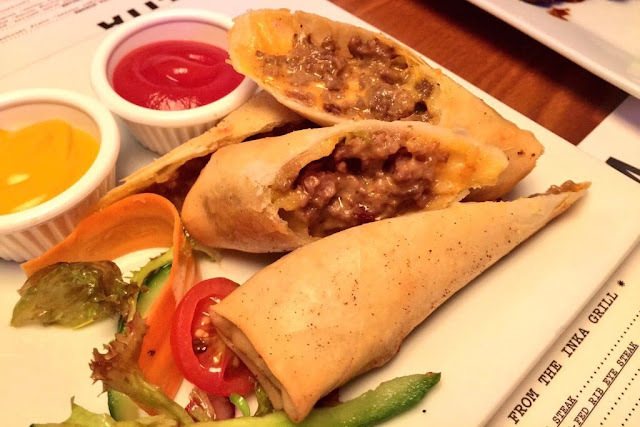 Encased in crisp spring rolls wrappers, the meaty beef and bone marrow filling enrobed with oozing meted cheese is naughtily moreish. 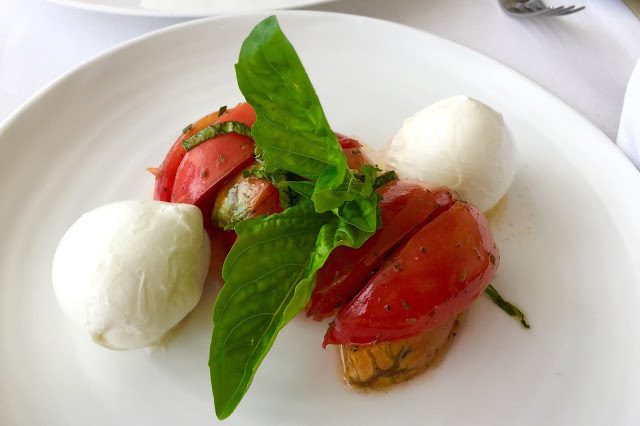 11.Insalata Caprese – Mammà, Capri (August) – whilst I ate tastier things in Italy this year during my visit to Napoli and Capri, it’s the memory of eating this Caprese Salad at the Michelin starred Mammà that lingers longest. 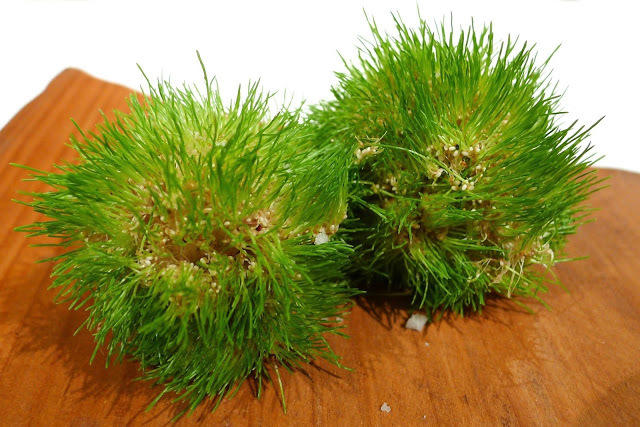 With the vibrant red and green of ‘il Tricolore’, it’s the perfect dish to represent the simple freshness of Italian food at its best… and where better to enjoy than on the island of Capri overlooking the Bay of Naples? 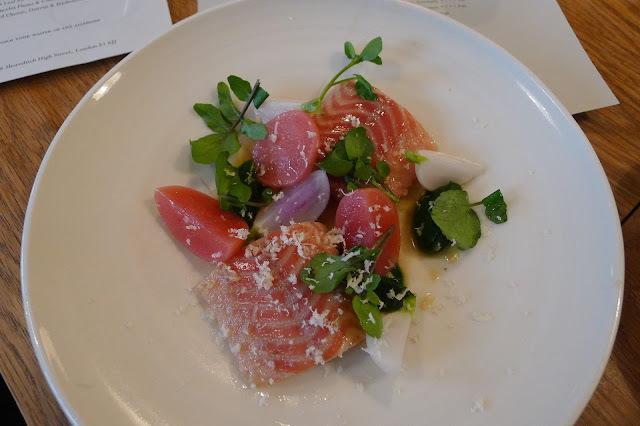 12.Smoked Eel & Radishes – Lyle’s, London (August) – I’d go as far as to say, Lyle’s is my favourite place to eat in the country. Chef James Lowe has an amazing ability to produce appealingly simple, highly satisfying dishes that are full of flavour. 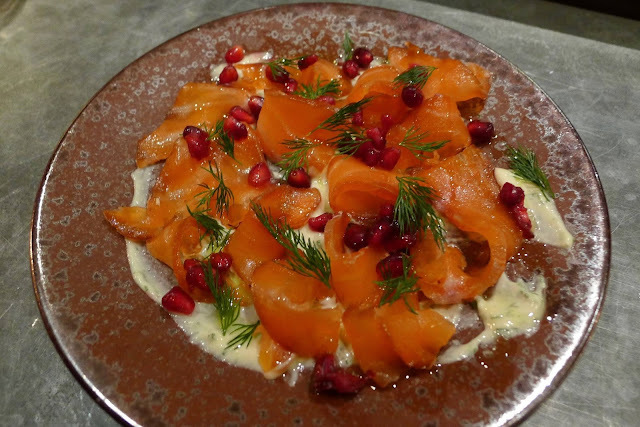 This simple dish, featuring two of my favourite ingredients being one such example. 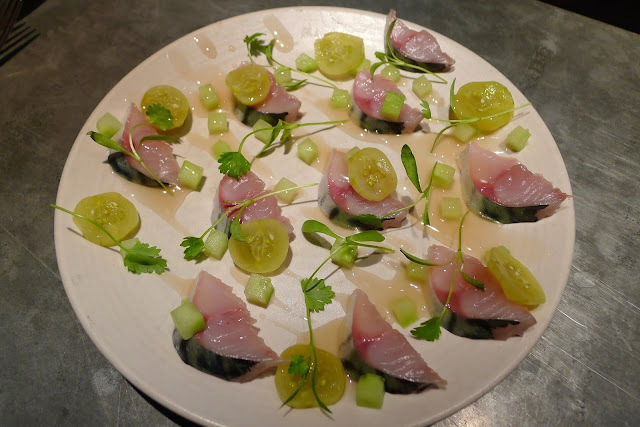 13.Mackerel Gooseberry & Elderflower – 64 Degrees, Brighton (August) – I’ve enjoyed a few great meals at 64 Degrees this year. It really is one of those places that just seems to get better and better with each visit. This is one of those dishes that sticks in the mind for its artful presentation as much as the flavours. 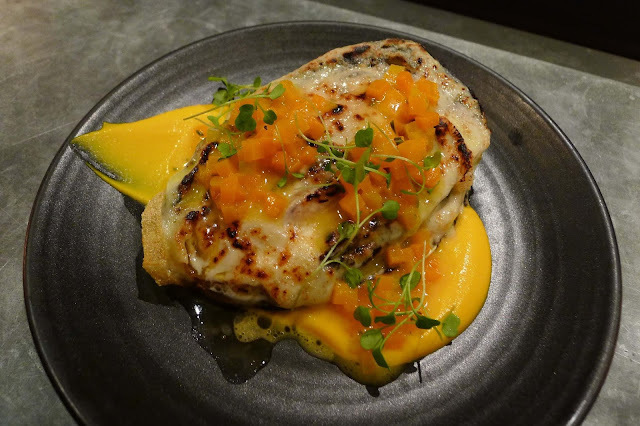 14.Celeriac with Honey & Mustard Seed Glaze – The Coach, Marlow (September) – with an unscheduled stop at “Tom Kerridge’s second pub”, the surprise dish of the evening was this wedge of celeriac cooked on the rotisserie. 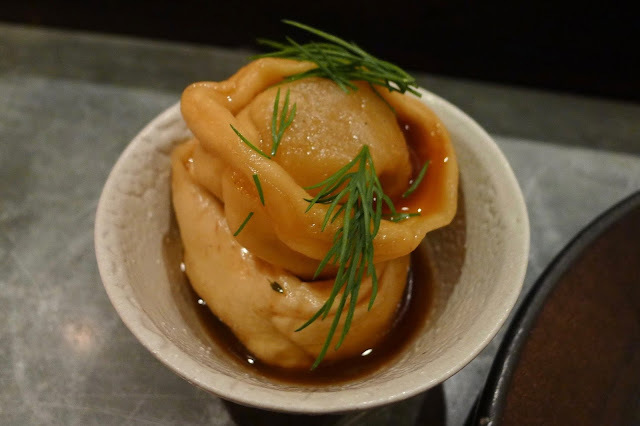 The honey and mustard flavours married beautifully with the celeriac, whilst the bite of seeds and tender flesh of the celeriac made the dish textually appealing. 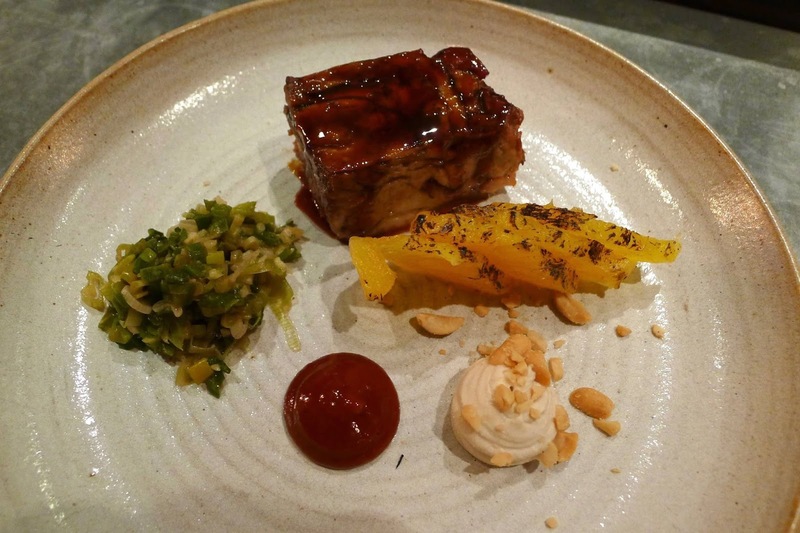 15.Sea Bass Belly with Young Kimchi – Parkers Arms, Lancashire (September) – never before have I had a sea bass dish where the belly has been given the starring role. The firm, meaty texture of the fish with the crunch of the ‘young kimchi’ made for a textually delightful dish, made all the more so by the subtle ferment and chilli flavours. 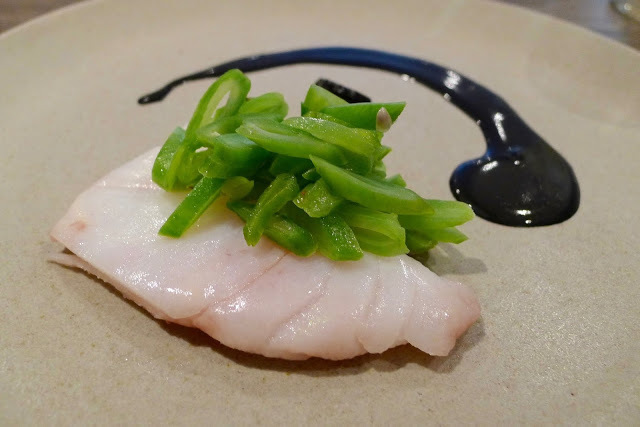 16.Poached Cod, Fermented Garlic & Runner Beans – Carters of Moseley, Birmingham (October) – a supremely elegant and delicate dish with a clarity of flavours that is just sublime. 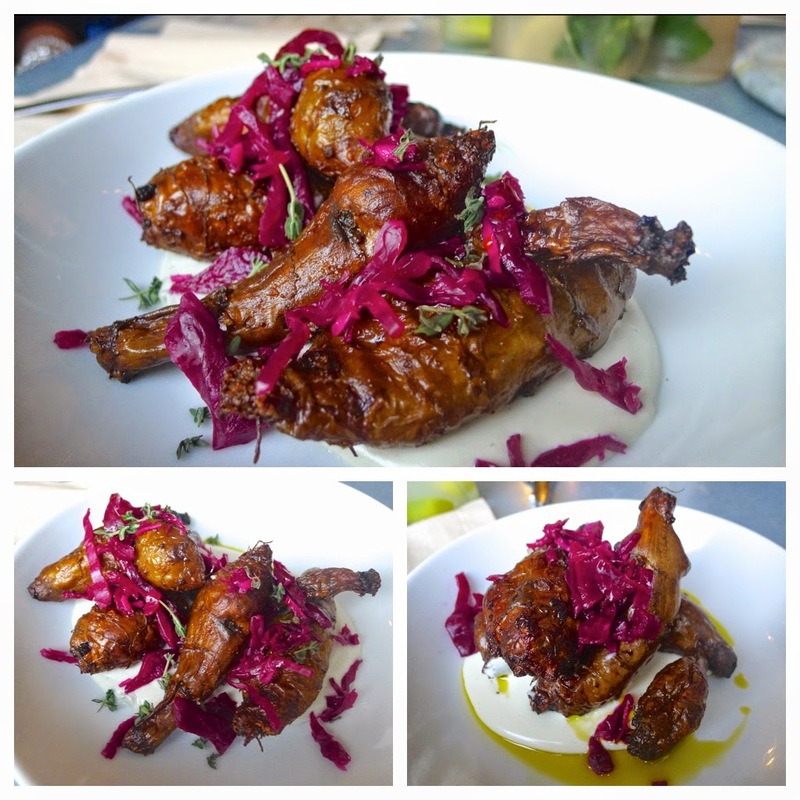 There is no where to hide with a dish so deceptively simple so cooking has to be flawless… and it was. 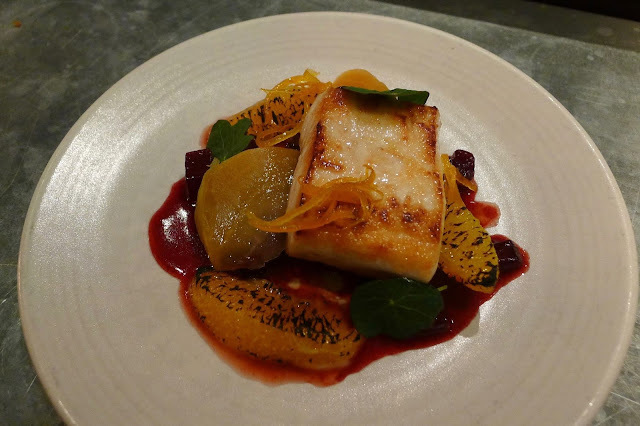 17.Monte Enebro cheese with Beetroot Crisps – Lunya, Manchester (October) – although I haven’t yet written a blog post about it, for me Lunya has (along with Rudy’s Pizza and Sugo Pasta) been one of Manchester’s best openings of the year. 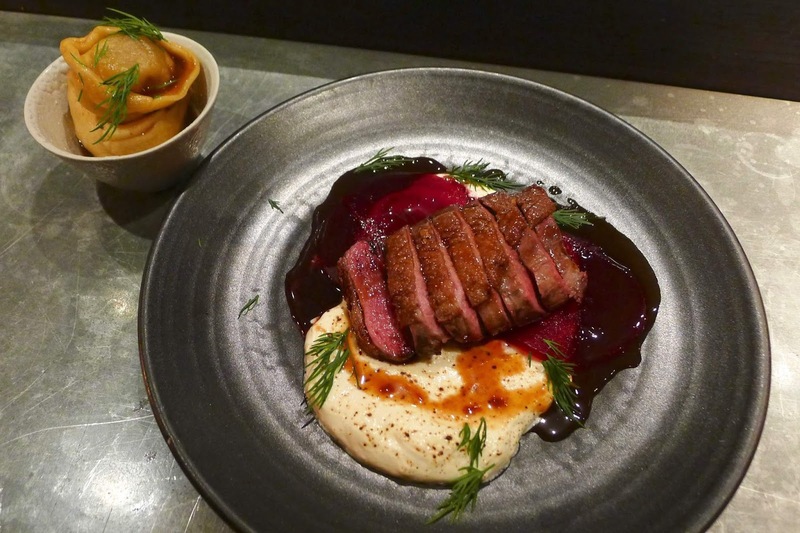 I’ve enjoyed several great meals there – including their fabulous whole suckling pig. 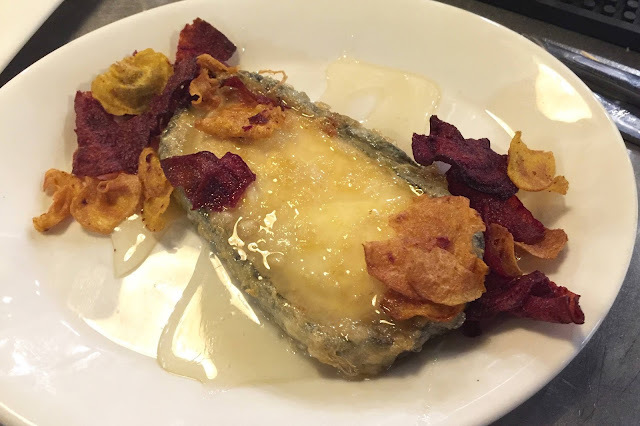 One dish I keep going back for is the Monte Enebro cheese with beetroot crisps. If you see a big Irish guy there called Morgan Leahy, get him to tell the cheese story… just don’t mention marathons! 18.Oreja de Cerdo con Tximitxurri (Pig’s Ear with Chimichurri) – Borda Berri, San Sebastián (October) – although the Argies take the credit for popularising Chimichurri (along with claiming the Falkland Islands is theirs), it’s Basque settlers, who arrived in Argentina in the 19th century, with their ‘tximitxurri’ “recipes” who deserve the plaudits. 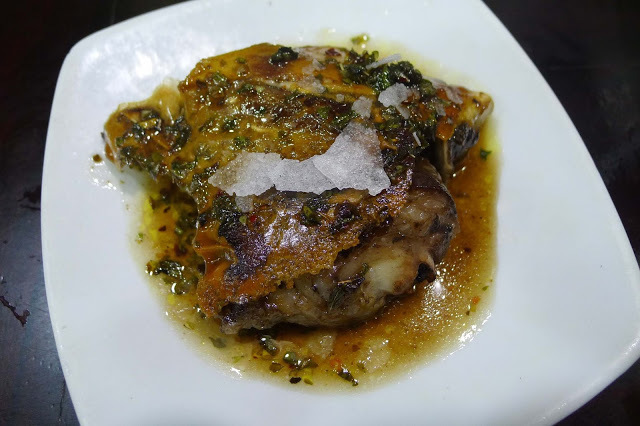 Roughly translating as “a mixture of several things in no particular order”, Borda Berri’s tximitxurri was the best I’ve eaten, it’s acidic vinegar tang the perfect foil for the fatty pig’s ear. 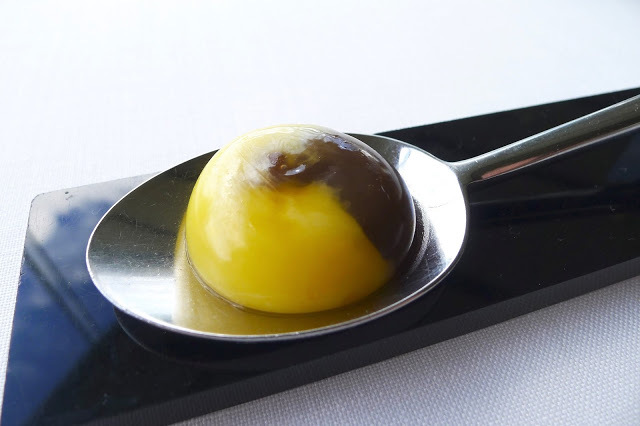 19.Egg from Our Hens, Cooked Inside Out & Truffled – Azurmendi, Bilbao (October) – those people who think “molecular gastronomy” is all fur coat and no knickers, need to get to Azurmendi to eat their signature truffled egg. I could bore you with the technique but suffices to say, the resulting globule of truffly, eggy goodness is nothing less than sublime. 20.Vegetable Tiles: A Handful of Highland Grass (Teselas vegetales: Un Manojo de Semillas y Brotes de Teff) – Mugaritz, San Sebastián (October) – this is one dish that is on the list more for it’s presentation than flavour… that’s not to say it didn’t taste great but the cute, Furby like ball was so original and playful that it had to be included. 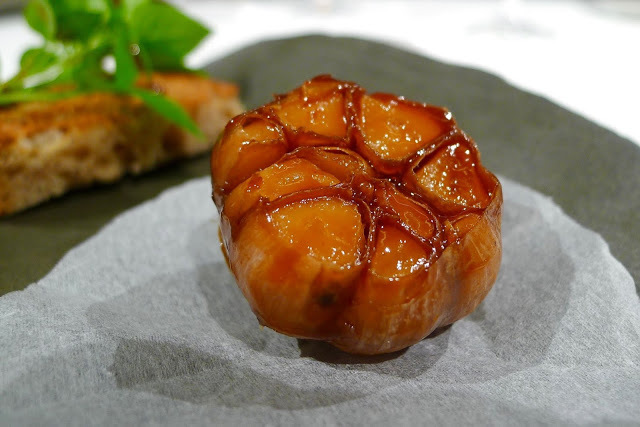 21.Garlic Glazed in Lamb Juices (Ali Glacé) – Mugaritz, San Sebastián (October) – of all the dishes at Mugaritz this is probably one of the simplest but squeezing the gooey garlic cloves out of of their glossy bulb onto toast was particularly pleasurable… eating it, more so! 22.Lamb, Haggis, Swede & Sage – Alimentum, Cambridge (December) – with it’s crispy coating, unctuous lamb breast and hearty haggis ragu this was a delightful piece of assured cooking and an intensely flavoured dish which managed to simultaneously be both refined and robust. 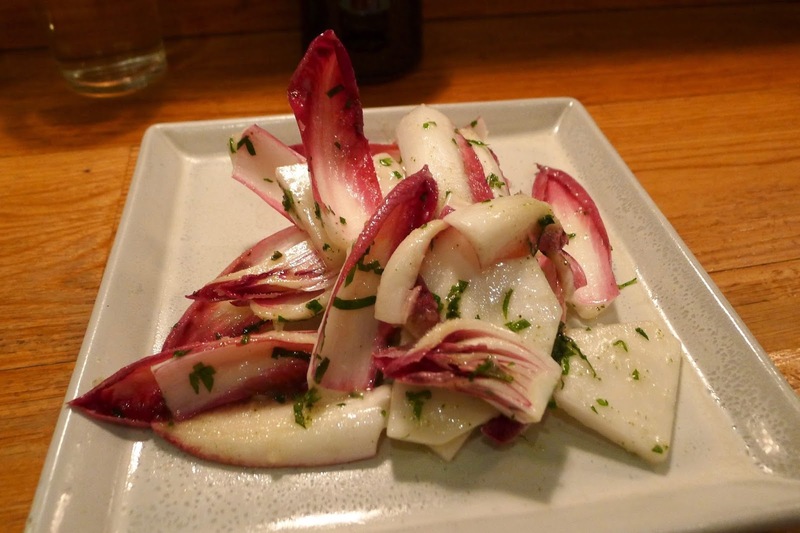 23.Red Chicory, Turnip & Shiso with Kombu Salt Salad – Koya Bar, London (December) – with a couple of hours or so to kill whilst waiting in the “virtual queue” for Hoppers (see the next dish), I decided to pop into Koya Bar for drink of their hot ginger and a couple of light bites. I’m glad I did because this unassuming dish was a delight. Bitter, sweet and salty with fabulous crunch it reminded me of why I love the clean, simplicity of Japanese food.